The stadium was built along with several other sports venues in 1954. It's the only one of three stadiums in the complex, belonging for over half a century to the police, which went through a thorough revamp in 1990s, receiving floodlights and seats. 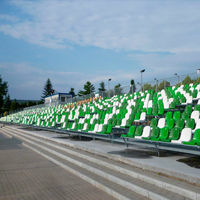 Western stand with a tall referee tower consists of modest tubular seating sections, while the opposite side is based on sloped land. The stadium has hotel rooms and tennis courts adjoining. The stadium serves athletic events for the most part, while football and speedway games are played just meters north, at a bigger stadium. The stadium's most distinctive feature are its floodlight masts. Each 41.8-meter tall, they're created with 36 individual steel poles creating 6 pylons of pentagonal footprint. Since they're one of a kind, they're being preserved and had the most recent complete renovation in 2016. They're not really new, but show a lot of Greater Poland's football history. Amazing floodlight masts at Olimpia, vast wooden benches at another neighbouring stadium or modest and newer stands of Warta and Pogoń? You choose!